It’s playtime! 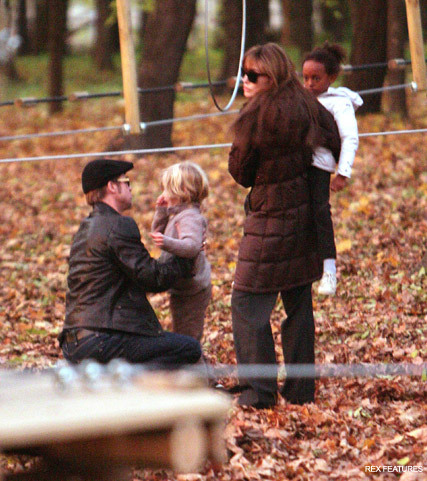 Brad Pitt and Angelina Jolie looked in high spirits earlier this week, when they took time out from their busy schedules to treat their brood to a day out at a local outdoor adventure park. SEE BRAD AND ANGLINA’S RELATIONSHIP HISTORY HERE! The Pitt-Jolie family have decamped to Budapest while Ange shoots her first movie, a bitter love story set against the backdrop of the Bosnian conflict in the 1990s. Earlier this month, the first pictures emerged of Angelina shooting her directorial debut, overseeing filming, and even roping in Brad to help out around set, and snap some pictures of her while she was at work. But earlier this week, the pair decided it was time to take a break, making a trip out and about with their children the order of the day. And there were all sorts of activities on hand to keep the kids amused during their family outing to an adventure park, with climbing ropes, an activity course and even a zip wire for them to try their hand at. 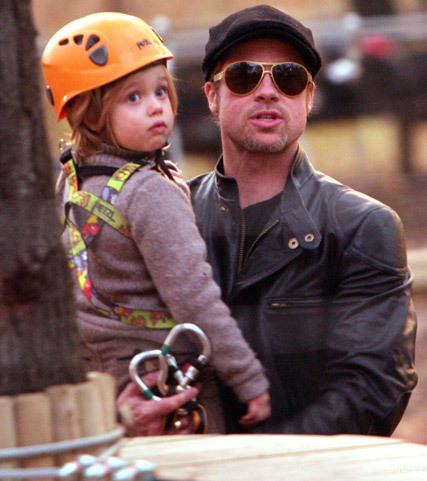 Shiloh decided to try her hand at the zip wire, and was spotted sporting full safety attire as she was carried along by proud parent Brad. The brave tot also tried her hand at the activity course, while Angelina spent time supervising her excited siblings. But after their day out, it was back to work for Ms Jolie, who was spotted resuming her place on the snow-covered set yesterday. Are you looking forward to Angelina’s directorial debut? Let us know in the comments box below. SEE BRAD AND ANGELINA’S RELATIONSHIP HISTORY HERE!